Factors such as pregnancy, age, and weight fluctuations lead to stubborn deposits of fat which are difficult to eliminate with a regular diet and exercise regimen. Liposuction by Dr. Rokhsar is designed to gently remove fat from certain areas, providing better contouring and an improved overall appearance. Liposuction (liposculpture) is frequently performed by Dr. Rokhsar in his Manhattan practice. The procedure is very effective for removing stubborn fat deposits in many areas of the body, including the abdomen, arms, legs neck and more. Under the care of board-certified dermatologic surgeon Dr. Rokhsar, liposuction is safe and offers optimal results. At his NYC practice, Dr. Rokhsar offers the latest, most advanced liposuction techniques to produce beautiful, desirable contours and a more athletic appearance. Remove unwanted fat safely and gently. As one of the most experienced liposuction surgeons in New York & Long Island, Dr. Cameron Rokhsar, uses the most advanced minimally invasive liposuction techniques in a state of the art accredited surgical facility. Modern liposuction places an emphasis on achieving desirable results through advanced techniques. Your liposuction procedure begins with the administration of a local anesthetic. When the anesthetic becomes effective, a small incision will be made in the area to be targeted by the liposuction procedure. 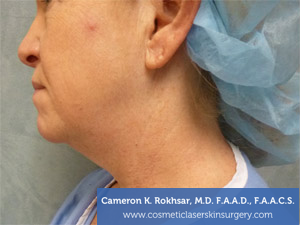 The incisions made by Dr. Rokhsar are so small that they often don’t require suturing. A small tube, called a cannula, is inserted through this incision. The cutting edge liposuction procedure performed by Dr. Rokhsar uses the smallest cannulas possible to achieve the evenest results. This method is less invasive than that achieved by traditional means. Dr. Rokhsar often combines the liposuction procedure with lasers to assist in melting the fat, or with ThermiTight to encourage skin tightening. 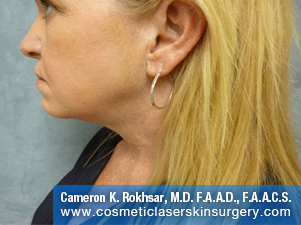 Dr. Rokhsar provides a wide range of services to his New York liposuction patients. Recovery from liposuction in Dr. Rokhsar’s hands usually only takes about a week and you should be able to resume daily activities, like work, in a couple of days. Fluid retention and swelling may persist for a few weeks, but usually only at a minor level. Dr. Rokhsar gives each of his patients unique and individualized recovery instructions designed not only to provide for their comfort but also to help protect the results of the liposuction procedure. Once recovery is complete, most patients notice a significant change in the shape of their body, slimmer, but with natural-looking curves and contours. For many patients, the reshaping of the fatty areas that have plagued them for years can be a positive experience and boost confidence. Individual results will vary from patient to patient. If you are bothered by areas of fat that simply don’t respond to diet or exercise, liposuction may be your ideal option for getting the body you want. Liposuction is frequently performed on the upper arms, but Dr. Rokhsar also uses the treatment to address other areas such as “bra rolls.” His technique is performed carefully to prevent over-removal of fat and ensure contour is done properly. 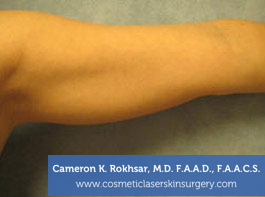 If you have excess skin of the arms, sometimes an arm lift or brachioplasty can help. Arm liposuction is used to improve a disproportionate appearance of the arm or create a thinner appearance proportionate to the rest of the body. The entire procedure is done under local anesthesia with the tumescent technique, eliminating a lot of risks that are related to general anesthesia. 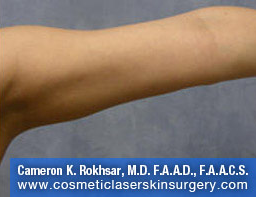 Hanging Skin– A section of fat that hangs off the arm in a horizontal position along the back side of the arm (below the triceps). Anterior Axillary Fat Pads– A pouch of fat located on the chest just in front of the arm-pit. Bras can push the fat upward and off to the sides, making them more obvious and unsightly. Post surgery, absorptive pads are used for one to two days and are held in place using a torso compression garment to reduce bleeding and bruising. Posterior Axillary Fat Pads– A fat pouch located just behind the armpit on the side of the back (trapezoid muscles). Post surgery, absorptive pads are used for one to two days and are held in place using a torso compression garment to reduce bleeding and bruising. Saddlebags are an accumulation of fat typically found on women. Most common areas for fat deposits on women are the abdominal area, hips, and thighs. Liposuction is used effectively to treat saddlebags, with the option to combine procedures to address dimpling and improve contour. Liposuction of the thighs, normally the inner thighs is an area of the legs that Dr. Rokhsar normally performs this treatment on. Diet and exercise alone typically do not address fat deposits in this area, leaving liposuction as a viable option for reducing the size of the inner thighs. 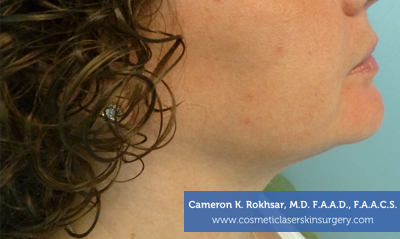 The NYC board-certified dermatologic surgeon removes the fat carefully to avoid contour irregularities. Fat accumulation in the buttocks region can be greatly reduced using liposuction. 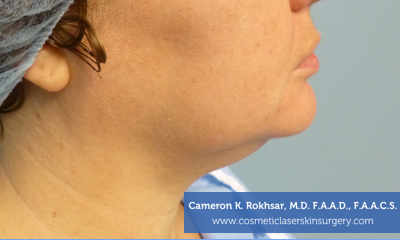 The procedure can improve not only size but shape and symmetry. Subcutaneous fat can collect along the buttocks, just over the gluteus maximus muscles. Sacral fat pad– a portion of fat that sits at the top of the buttocks and just below the back. Horizontal crease– The crease made just below the buttocks, creating a line along the top of the thighs. This line is composed of a meshwork of fibrous connective tissue (also known as Luschka’s ligament) that loosely connects the skin to the gluteus maximus muscles (buttocks muscles). Some people do not have a crease. Banana-shaped bulge– A fat pad found below the horizontal crease that forms on the upper thigh. The banana shape pouch of fat sits immediately below the buttocks. Double horizontal crease– When took much fat is removed from the banana-shaped bulge. Patients should be advised that no more than 50% of the bulge can be removed or they can be left an almost irreparable and noticeable scar that forms a second crease. Liposuction is an option for those that would like to remove excess fat in selected areas. Body reshaping can also be done through SmartLipo, Liposonix, LipoLite, a combination of a minimally invasive liposuction procedure with the additional use of a skin tightening laser. Liposuction is a surgical technique used to remove excess fat from deposits between skin and muscle. After intravenous sedation anesthesia is administered, small incisions are made across the area and a stainless tube is inserted. A strong suction pump removes the fat through the tube, making the total operation last between 30 to 60 minutes long depending on the amount of fat being removed. It is important to be aware of effective alternatives to fat-reduction for those that are surgery averse. The ultrasound of Liposonix creates a powerful thermal effect that focuses at specific depths in fatty layers, safely destroying fat without damaging surrounding tissue in a one-hour session. This minimal risk procedure uses high intensity focused ultrasound to destroy targeted fat in the abdomen, flanks, back, thighs, buttocks, and arms, which show results within 8 to12 weeks. It should be noted that Liposonix has few exceptions for candidates. Those who are pregnant, using certain hematologic medications and those with a body mass index greater than 30 (obese), or inversely those with less than 1cm of the fatty tissue below the ideal treatment depth, or those with cancer. As with any surgery, liposuction is accompanied by risks such as excessive bleeding and a negative reaction to anesthesia. Discuss your concerns with Dr. Rokhsar. Liposuction is one of Dr. Rokhsar’s most highly sought after procedures. The cosmetic treatment addresses and removes excess, stubborn fat, beautifully contouring the body. Why Choose Dr. Rokhsar For Liposuction? Dr. Rokhsar has done more tumescent liposuction procedures than any other physician in New York City and has been doing it for 20 years. Dr. Rokhsar is fellowship-trained in liposuction surgery having finished a concentrated training year in liposuction surgery after residency. Many dermatologists in Manhattan have entrusted Dr. Rokhsar with their own liposuction surgeries. He is an internationally renowned cosmetic laser surgeon who has exceedingly advanced knowledge and experience working with Liposuction. Using Liposuction to contour the body, takes a surgeon, like Dr. Rokhsar, with significant training, impressive results and expert patient care. If you’re interested in Liposuction in the New York area, contact us today. To get started on your liposuction procedure, contact us today!